Mobile credentials have been around for several years, but surprisingly have not seen a significant adoption rate. Openpath took a look at the challenges faced by existing access control providers and designed a true mobile experience that has driven an amazing 94% adoption rate by its users. What were the challenges preventing users from switching to a mobile access control system? See what a panel of experts had to say about it and how Openpath designed a Solution to solve those issues. The greatest obstacle to large-scale adoption of mobile credentialing in the access control industry is probably not a technological hurdle but a hardware one, which can lead to a lack of willingness to adopt new system designs. Many access control systems are not brand new and, in turn, use legacy technology that does not support readers capable of handling mobile credentials. Mobile credentials have been slow to take off because legacy readers traditionally did not have Bluetooth or NFC capacity. 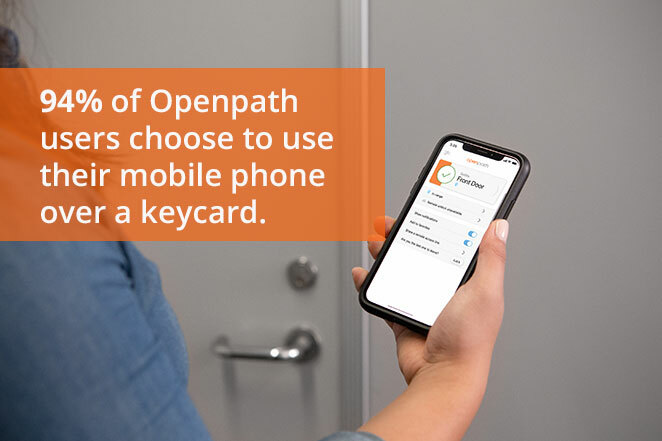 Openpath’s designed it's smart reader so that is compatible with legacy readers which allows you to run the systems in tandem if you want to keep your old credentials while also being able to leverage the mobile credential that Openpath offers, including Bluetooth/NFC capacity. Openpath's solution also uses the same wiring as legacy readers which makes it easy for businesses who wish to upgrade their system to a cloud-based mobile access control system. We’re still in the early phases of the shift where most people are trying to use the “new technology,” i.e. a smartphone, to do what the old technology did (badge at a door), rather than leveraging what is now possible to deliver a new, better experience. Openpath’s mobile credential does not require you to take out your phone to “badge” in. Faster and more convenient than opening an app or using a key or fob, Openpath Touch and it's patented SurePath technology automatically recognizes a user’s smartphone as he/she approaches, even if it's in a purse or pocket, and allows the user to enter with only a wave of their hand or a touch of the reader. Openpath supports key cards and key fobs for those who still prefer to utilize those access methods. A further obstacle is the large cost of re-credentialing an entire workforce. Openpath makes providing mobile credentials easy by offering native integrations with directory services such as Google’s G-Suite, Microsoft Active Directory and OKTA. Openpath automatically syncs with these providers and updates in real-time so anytime a user is added or removed they are automatically granted a mobile credential or has their credential revoked. There wasn’t a simple solution for handling visitors and contractors that might require short- or long-term temporary access. Openpath’s mobile app offers a guest pass feature that allows you send a temporary mobile credential via email or text message. You are able to pre-determine how long the credential is valid for and does not require the visitor to download the app. By taking a step back to reevaluate the entire user-experience; from the employee who doesn’t want to carry around one additional extra item (and keeps losing it anyways), to the system administrator who spends unnecessary hours tracking and monitoring the outdated credentials, Openpath was able to create a system that allows for a Solution that is secure, seamless, and flexible. Click here to learn more about our unique product features and to see how it works!